Children can develop their coordination skills while learning the order and how to write the first twenty numbers in this very child-friendly app. Whether your child wants to work alone or with adult support, this app provides a fun and useful activity. This app’s title on the App Store differs from the one that is shown on the title screen. Here it is known as Pups with Numbers and this gives a clear idea of the two main themes of the app. 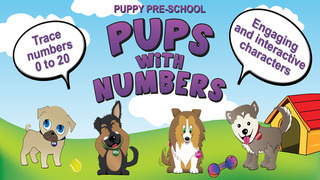 Puppies are the child-friendly guides through learning about how to form numbers. This is a tightly focused app that is designed to help children learn how to correctly form written digits. There are no distracting links or other screens to distract from its main purpose. After choosing one of the cute animated puppies to guide them in their learning, children begin at zero and work their way through to the number twenty. The chosen pup leads the route that the player’s finger should follow as they write the number. You’ve probably seen this teaching device before in an app, but it is particularly well executed here. Too often in other apps, the invisible markers through which children’s fingers must pass to stay on the good side of correct are too sparse or poorly positioned. This leads to children being able to form some crazy shapes that are marked as correct because they occasionally stray back into position. This is much more tightly controlled in this app and finished numbers will look correct. The developers of this app recognise that the target users of it won’t have secure reading skills and so every instruction, correction and word of praise is delivered in a clear spoken form. From the soft Australian accent you can make a correct assumption about where the developers are from, but there are no examples of any phrases that are unique to its home country and so it is perfectly understandable by everyone. Children are rewarded with graphical effects in addition to this verbal encouragement. Throughout the app, the presentation and polish are excellent. Colourful, but not garish, graphics are child-friendly and the pups will be endearing to children although they may lead to a false assumption. The assumption, perhaps through conditioning by other apps, is that each pup will lead the player through a different game or activity, but this is not the case. It only changes the guiding pup. The activity is so well presented and enjoyable that the expectation that there are more like it may lead to disappointment. The developer promises more apps led by them so this variety will come with time. Educationally, the app meets its objectives – both curricular and in child-development. Playing through it will give children a strong foundation in both writing numbers and knowing the order of them. Children can easily pick up the app and play independently with it, but parents and teachers can also use it as the focus for them to work with their child as they learn. With a crayon and some paper, they can easily help their child to begin to apply what they have learned to real life. When building up a collection of learning apps for your pre-school child, you could do much worse than let these pups help out. 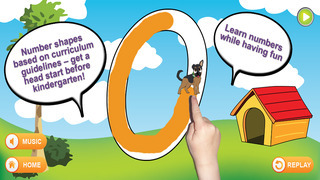 Cute, adorable puppies make learning fun as your child joins them in Puppy Preschool to learn about numbers. The Preschool Kids Math app introduces great math concepts such as number recognition and problem solving. As your toddler learns to trace the numbers 0 to 20, they are not only becoming familiar with the math concepts and numbers, they are also developing their fine motor skills, preparing for the skill of writing and increasing their attention span. 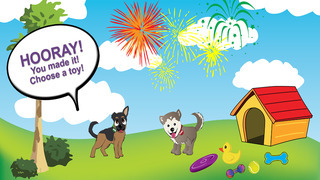 • Success celebration screens for reaching milestones at numbers 10 and 20—help the puppy choose a toy! The Preschool Kids Math game has been designed for any child from the age of three up to preschool and early school years. It is also ideal for the special needs child, as the trace function gently provides the child feedback encouraging them to stay inside the lines of the trace and after four attempts, shows the child the correct trace. 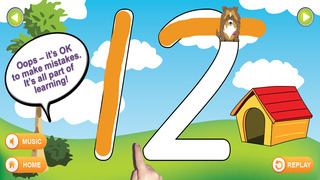 Your child will love the friendly and funny puppies which make this kids math game fun as they learn. 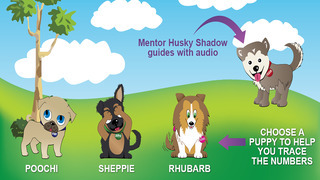 Guided by the caring and gentle adult dog, Shadow, your child can choose one of the three puppies, Sheppie, Poochie or Rhubarb, to accompany them on their adventure to learn. This game combines educational expertise, and original graphics and music from two of Australia’s top artists to give your child an engaging, interactive and unparalleled learning experience. What also sets this preschool kids math game apart from other apps is the Aussie flavour. This means children around the world get exposure to real Aussie accents. Preschool Kids Math has been developed by an all Australian team with original character graphic design Ruwandi Perera, and custom composed music and voiceover by Duncan and Trish Delaney-Brown internationally renowned musicians based in Sydney. Preschool Kids Math encourages fun play-based learning, allowing your child to actively explore the digital environment, take risks, make mistakes, figure out the activity as they go and build confidence through play. Through the joy of playing, children begin a love of learning and prepare for life itself. All of this Preschool Kids Math game’s features tick the boxes parents are looking for. It combines, play-based learning, education, fun, learning, math, trace, puppies, dogs and no advertisements or in app purchases in a quality educational package. Also, Preschool Kids Math has almost no words on the screen, because we know many of our audience can’t read. All our simple instructions are given by the friendly dog, Shadow. This is one of the best kids math app experiences you and your child can have. Download this preschool math app today and ignite your child’s Flame for Learning!